Lavender bushes, a shaded terrace, a swimming pool, and a breathtaking view of one of the most beautiful bays in the world. We are describing here the postcard of the Côte d'Azur, and yet you, too, can enjoy your holiday here without emptying your piggy bank. The Côte d'Azur attracts many French and foreign summer visitors. You will be among the 3 million to visit us every year along the 150 kilometers of coastline that connect Toulon and Menton. 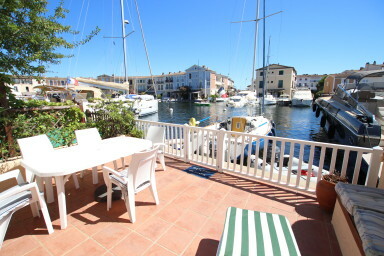 Also, if you want to enjoy an idyllic setting while feeling a bit at home, you can rent a house in Port Grimaud. Holiday rentals is the solution offering the best bang for your buck when it comes to spending a dream vacation as a couple or among family or friends. This is especially true in a region like ours, where the price of real estate is relatively high and hotels are expensive. According to a study carried out in July 2014 by the site Allovoyages, it is necessary to spend at least €158 per night in a 3-star hotel in August. Therefore, for a week (6 nights) and for only 2 people, the total is €948 for a room of about fifteen or even twenty square meters, with the obligation to eat out for all your meals since there is no kitchen. 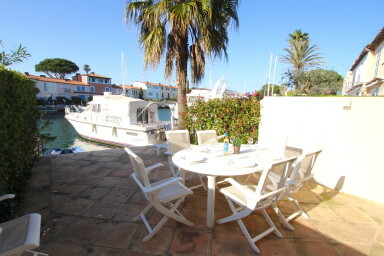 For the same price, we offer fully furnished and equipped apartments along the canals of Port Grimaud. You can accommodate up to 4 people. If you want to come with your large family or with friends, we advise you to rent a house. 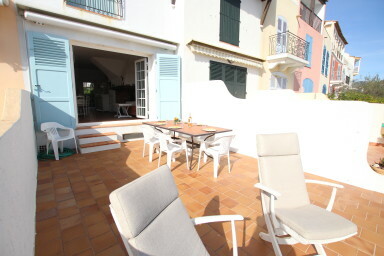 For €2,000 on average, you will benefit from an exceptional deal: a large waterfront house, air-conditioned, overlooking the canals, and often equipped with its own mooring to dock your boat. How to rent a house? 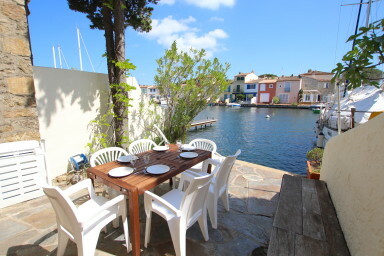 To rent your house in the lakeside town of Port Grimaud, it couldn't be easier: just visit our site boutemy.net/en and browse our rental ads. Thanks to the trust we have built with the owners of the village for almost two decades, we are the local agency with the largest selection. From the small, cozy, and warm apartment to the sumptuous, exceptional houses, we can offer you a rental adapted to your needs and to your wallet. Depending on what you're looking for (surface, size of mooring, number of rooms), you will be able to select the criteria that interest you. 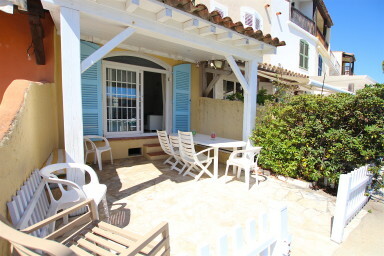 We also indicate the location of the property in one of the 3 districts of Port Grimaud. 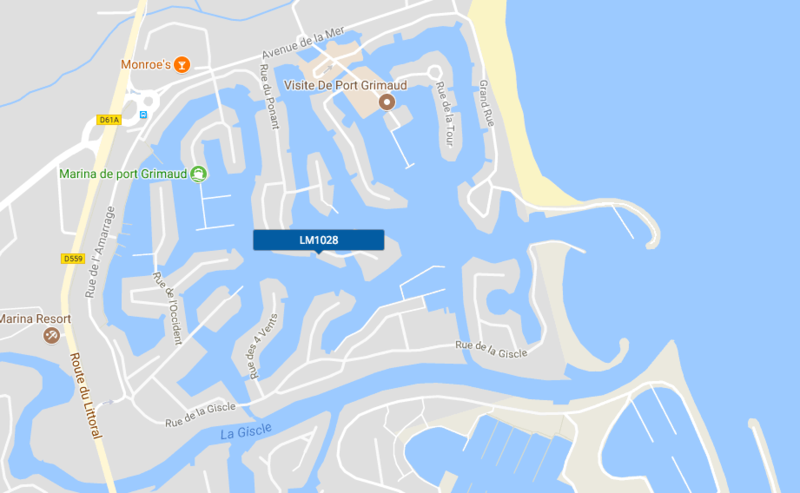 To locate these 3 neighborhoods, we invite you to view the map of Port Grimaud, which is shown on the page of each real estate announcement. 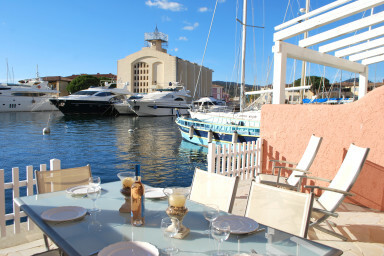 We have prepared it to help you locate and identify the main points of interest in Port Grimaud. The availability of our homes is also listed on each announcement is also. As you can see, the months of July and August have been rapidly taken by storm. That is why we invite you to book as soon as possible and to contact us as soon as you locate a property. To do this, you can call us at 04 94 56 56 58 or send us an email at agence@boutemy.net. We have also designed this site so that you can access as much information as possible from the very beginning. 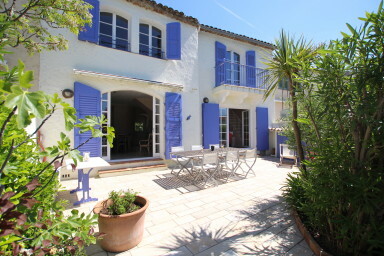 From the home page of our site, you can click on "rental" and select "houses with mooring". 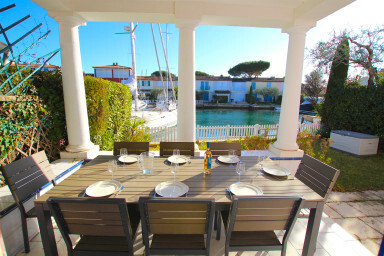 These are the most sought-after properties in Port Grimaud because the fact of having a mooring for almost each house, makes them unique in France. 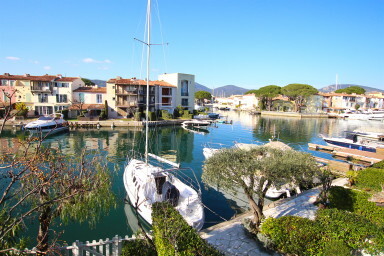 Therefore, it’s not surprising that Port Grimaud is considered as a paradise for sailing lovers. Our rental bookings increased by 20% in 2018 compared to 2017. This is why our agents Marion and Yael are constantly looking for new properties to present to you and to be able to meet a high demand. 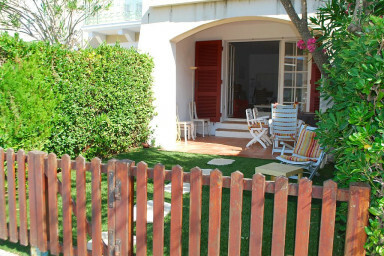 To continue your search on the site, you can quickly select search criteria such as the price per week, the size of the mooring, but also the number of bathrooms, the number of bedrooms and people that can be accommodated. And above all, we are the only agency in the village to offer you the geolocation of houses for rent. They are all represented by a "pin" on the map that appears on the right side of your screen. 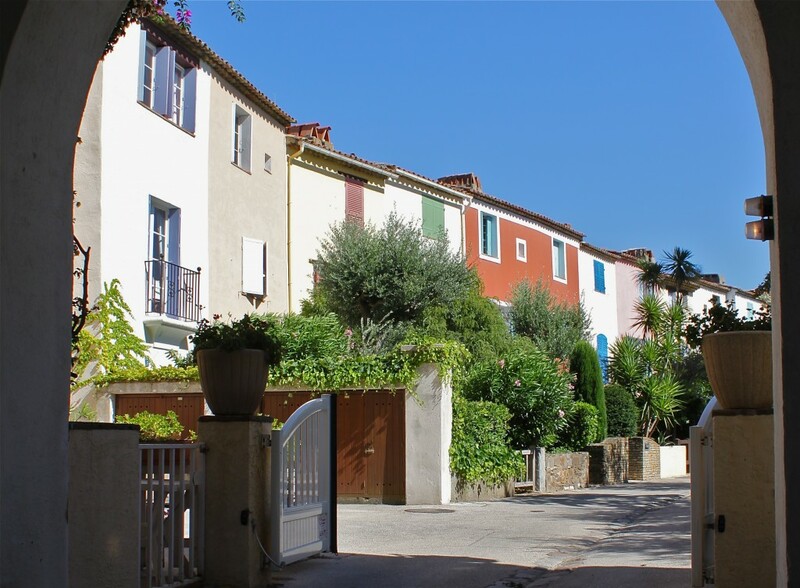 Also, if you have a preference for one of Port Grimaud's neighbourhoods (condominiums), your search will be made easier. 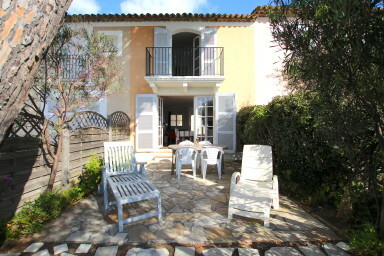 We wish you a pleasant stay in your villa in Port Grimaud. 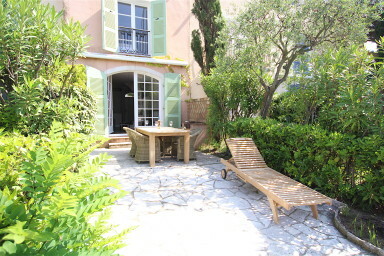 Many enjoy a private terrace, a garden, or even a swimming pool. You’ll find all the luxury and comfort you need for a wonderful holiday.